Dear Syirah had called Fauzie to say that Ashmi was on the way to hospital. He had a fall in the toilet. ( Syirah is currently working on the same project with F thus the call so that he could help inform the production crew.) They were supposed to have shoot together the next morning. I remembered saying my prayers for Ashmi and had hoped that he would be ok. He had to be ok. He was only 34 and had a bright future ahead of him. I had also read the interview in The New Paper earlier in the day in which Syirah said they had plans to get married. So he had to be ok. His future was laid out for him. 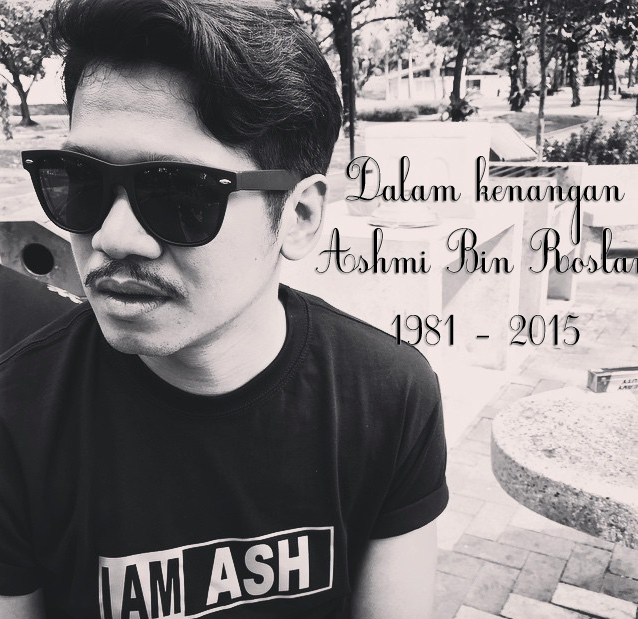 I was in the bedroom to get ready to go to bed when Fauzie came in and with a solemn voice he said, “Ashmi dah meninggal.” My body went rigid and I had goosebumps. I replied, “huh?? what b??”. My mind couldn’t accept it. He was so young, only 34. And already gone. Immediately, I thought of Syirah, and his family and thought sadly of how were they going to cope with their loss. Over the span of few hours, the tributes poured in, from family members, close friends, friends, acquaintances and fans. Almost all of them couldn’t believe that he was gone. I’m one of them. I think most of us couldn’t sleep much at night. We were just in shock. The news just ….. just sounds so final. As I lay on my bed, unable to sleep and waiting for Fauzie to come home from the hospital, i thought of the reason .. why were we so affected and I realised that It’s hard to come to terms with something so permanent like this. I really couldn’t come to terms with it. Mostly because of the thought of losing someone that you are so used to. Losing that someone would mean losing your daily routine in life. it changes almost everything. That someone whom you talk to everyday, morning and night and all hours of the day, the one you confide in, the one you let out your problems to, the one who knows all your quirks but will just layan it anyway, the one you go to for a much-needed hug to feel better, the one you can call randomly just coz’ you miss their voice, the one who constantly supports you no matter what and most importantly, is your pillar of strength. That someone could be the one who gives you meaning and purpose in life, and simply, cos’ that someone loves you so so much, as much as you love them back. I couldn’t imagine my life being disrupted so suddenly, and that’s why i felt so much for Syirah. And I bet that’s why some people got so affected and couldn’t accept the fact that he’s gone, so suddenly and too soon. Syirah lost her love of her life and her pillar of strength. And it killed me seeing her so weak at the cemetery because I’m so used to her bubbly and lively self, always ready with a smile. I hope she stays strong, and I pray that Allah swt will give her the utmost strength to go through this loss. And I hope she knows that we are all here for her. I hugged Fauzie a little tighter that night, partly because I was shaken but mostly because, i”ll never know if it would be the last hug i’ll ever get from him. I promise myself to appreciate and love him more and to be annoyed and mad at him less. Sadly, it had taken a sudden death of a friend to make me realise that life is short, and that Allah could take away our souls anytime, irregardless of your age, health and the amount of wealth that you have.